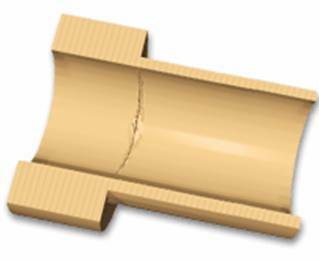 A brittle molded part has a tendency to break or crack. Brittleness results from shorter molecular chain length (thus lower molecular weight). As a result, the physical integrity of the part is substantially less than the specification. Excessive drying either drives off volatiles in the plastic, making it more sensitive to processing, or degrades the material by reducing the molecular weight. Contact material suppliers to get the recommended levels of regrind to use. Minimizing residence time reduces material degradation. Increase melt temperature within limits, not to overheat the material.